We're now in the part of the season where every game matters, and the race for a playoff spot is a tight one. Last season six teams in the North division made the playoffs. This year only the top four will move on to the first round. Port Huron looks like they might keep the number one spot from here on out, but the battle for spots two through four is heating up. After Johnstown was swept this weekend, Michigan took over second place. Johnstown now sits in third place with Soo only one point away from tying Johnstown. To make things even more interesting, Springfield is only three points away from Johnstown. So the race is heating up for sure, and this is the worst time to go into a funk, which the Tomahawks are finding themselves in now. Johnstown has lost three in a row and has only won one game in their last six. The Tomahawks seem to have a new injured player every game that isn't helping them stay consistent, but they must find a way to put wins together or they will find themselves out a playoff spot come the end of the season. Johnstown is second in the North division in goals scored with 118, but have given up 127, which is only one goal behind Soo for most in the division. Simple answer would be, keep scoring, but work on the defensive side of things and they should be fine. If things were simple though, the 60-game regular season wouldn't be a challenge. For the Tomahawks there's a lot on the line, and a ton to play for, which the players should use as motivation to get the job done. 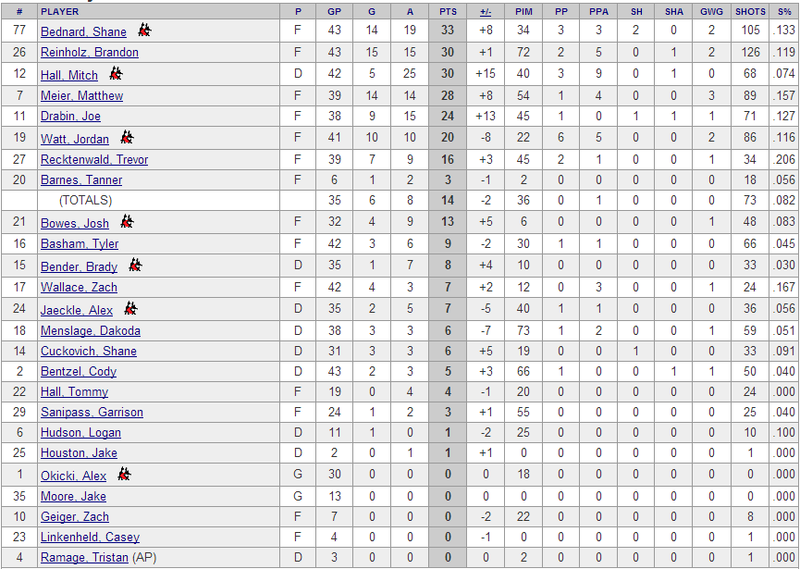 Currently there are seven players that are playing their last year of junior hockey. This could be their last chance to play a game they love and go out as champions. Also, as the rest of the players younger than them, they are trying to earn college commitments. College teams love winners. Amarillo is one of the best teams in the league and already have nine commitments this year. Johnstown pulls together a great ending to this season and you'll seen more players secure college commitments. Anther reason to turn this around, or use as motivation to give their all and climb up the standings, is the fans. Johnstown has the third best attendance in the league, and best in the division. The city of Johnstown hasn't won a hockey championship since the 1974-75 season. Bring a championship back to Johnstown and these players will go down in history. Also, Johnstown hasn't made it to a final since 1988-89, the first year the Chiefs were in the ECHL. This season, the NAHL playoff format is different from years past, there is no more tournament style in the finals, among the top division winners. The best team in round three and four hosts at their own building the entire round. This means that the home fans will have a chance to see their team win on their own ice for the time in several years, in the NAHL. How great would that be for Johnstown. The Tomahawks head on the road this upcoming weekend vs the Port Huron Fight Falcons. They'll then have a week off before playing back at home vs Michigan and Wenatchee. Johnstown had a new player in the lineup this weekend. Jake Houston. He recorded an assist in his first game with the team on Friday. In two games this weekend he was a plus 1. Houston was playing for the Pittsburgh Penguins Elite team before getting called up to Johnstown. First day of the two day tournament is over and saw Johnstown beat Bishop McCort 7-3. The second game saw Westmont beat Richland 5-1. Tonight Westmont will battle Johnstown in the championship game while McCort and Richland will square off in the consolation game. First game is at 5:30pm and the championship is at 7:30pm at the War Memorial. Westmont is a really good team and we'd say most of the team could probably try out for the Tomahawks if they wanted to. For Johnstown, we really liked Tre Pridgen, Devin Smith, and Vince Walters. After each game a few Tomahawks' players awarded the "Player of the game" from each team, a Tomahawks' hat and bobble head. Another reason why the Tomahawks are the best organization in the league. They always seem to do the little things right. We are into the final third of the season and this team continues to play sloppy. All weekend they gave away the puck by continually making blind passes to no one. The only time all season that I can remember this team playing what looked like a structured system, was the weekend of November 22nd when the Tomahawks swept Port Huron while dominating both games. It just so happened that GM Rick Boyd assisted with the coaching that weekend when Mile Letizia was out of town. Was having the GM behind the bench the reason that the team played so well that weekend?